UEFA Informer is a widget that has been designed for Windows users who love football. The widget displays league standings and game results of more than 40 leagues plus international competitions including Champions League and World Cup 2010 qualifications. The name implies that the widget concentrates on European leagues and competitions. The widget is compatible with Windows Vista and Windows 7 and will display a selection menu after installation. 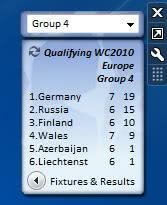 This selection menu displays various European countries (Germany, England, Spain, Italy, Netherlands, Portugal, France and Ukraine) plus the Champions League and World Cup 2010 qualification (including non-European groups). Selecting a country will display the standings of the main league of that country with the possibility to change to other leagues of that country. Each club is clickable in the league which will display the league results of the club. The football results of the selected club lead to statistics that display various statistics including the win / tie / loss percentage, longest streak or highest results. Champions League and World Cup 2010 Qualification use a slightly different display. 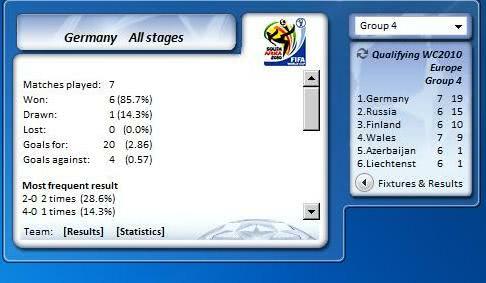 They initially display the groups and a link to fixtures and results. A click on the group will display the group's standings again with the possibility to display the matches of a specific club. Many football fans will surely find this Windows widget to display football results and league standings useful. The UEFA Informer widget is available at the Deviant Art profile page of the developer.